Liverpool muslim players – These day, it’s no wonder to see muslim players play in European clubs, including in English Premier League. One of example of EPL clubs with muslim players is Liverpool. Throughout its history, there are several Liverpool muslim players. Currently, they have 3 muslim players in Liverpool squad. They are Mohamed Salah, Sadio Mane and Emre Can. Beside those 3 players, Liverpool also have many Islamic footballers in the past. Some notable examples are Kolo Toure, Nuri Sahin and Mamadou Sakho. While those example are easy to remember, there are some name that forgettable too such as Samed Yesil, Oussama Assaidi and Carl Medjani. Several muslim players also gain succesful spells at Anfield. For example Djimi Traore who involved in Champions League final in 2005 when Liverpool beat AC Milan in match dubbed as Miracle of Istanbul. He also famously (or infamously) known as one of the worst player ever to play and won Champions League final. There are some muslim footballers in Liverpool from time to time. Below is list of Liverpool muslim player and his personal detail (birth date, position, club career, honours). 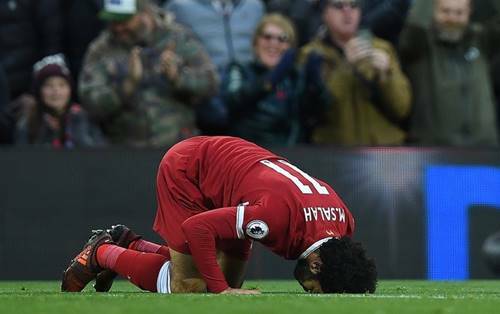 No doubt, Mohamed Salah is most on fire muslim players in Europe currently. Salah was born in Gharbia, Egypt on June 15th 1992. He ever play in some decent clubs around Europe such as Basel, Chelsea, Fiorentina, AS Roma and currently in Liverpool. He plays as right winger. Salah known as profilic goalscorer. His pace and acceleration are his main skills. Salah also become main star in Egyptian national football team, leading them to qualify in 2018 FIFA World Cup. Sadio Mane is football players from Senegal. Liverpool bought him from Southampton. Mane was born in Sedhiou, Senegal on April 10th 1992. He become key player in Liverpool, contribute with goal and assist for Anfield’s side. Mane also form profilic forward trio with Roberto Firmino and Mohamed Salah. While Salah and Mane is African-born, it’s different story for Emre Can. He was born in Frankfurt, Germany on January 12nd 1994. As a German, Emre Can also break through Germany national football team and become one of key player in Germans midfield. In Liverpool, Emre Can often play as defensive midfielder, sometime he even play as central defender too. In the past, there are many muslim player in Liverpool who spend his career at Anfield. Some player have succesful day (i.e Sissoko, Sakho), but there are many flop players too (i.e Sahin, Assaidi). That’s all of muslim footballers in Liverpool from past to the current days. Some muslim players like Mohamed Salah, Sadio Mane, Emre Can, Kolo Toure and Mohamed Sissoko is known ever play for Liverpool, some have left and some still play until now.